Yie Ar Kung Fu is a game that has always fascinated me since it was used in the game of martial arts in 1985, weapons of all kinds. The only thing that made me a little bit sorry for this game was that even the main hero did not have a choice of weapons, but he only relied on himself. As I said before, Yie Ar Kung Fu is a 1985 game so we can not expect breakthrough graphics, however fighter moves are very credible and creators deserve admiration. And now for the game itself. Bush is the first to challenge you. A fat man who weighs at least a couple of pounds, but he can fly like an eagle :-)) so he can move very quickly. Another adversary is Star, who casts you starfish, from which you have to quickly jump or be skillfully dismantled. Failure to count on the loss of life. And here is the third adversary Nuncha. Yes, this guy is the champion of the fight with the nunchaku. It is very fast and you can not admit it to the body, then you have a chance to succeed. Do not forget if you fight each of the Yie Ar Kung Fu fighters without hitting you, you get the perfect shuu and the extra life. The fourth enemy is a fat man named Pole, who is really good with a long wooden pole BO. And he can do it very well with it so it depends on what strategy you choose. 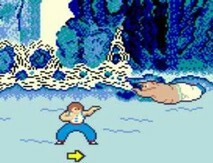 The fifth opponent in Yie Ar Kung Fu is Feedle. I have the feeling that this guy has twenty single brothers or just cloned, which I doubt because in 1985 there was not much to say about cloning :-)). The sixth enemy is Chain. Yes, by name it is obvious that this guy can do it with a chain. So you have to be very fast so you do not get it with your head. And here is the seventh enemy. Her name is Club. He has not only a nice stick with which he can break his skull, but also, as a defense in his second hand, to boil. So no fun. The eighth opponent in Yie Ar Kung Fu is the beautiful Fan woman who is throwing you fans. The problem is that fans have a very irregular flight direction, so there's a lot of trouble to avoid them. The ninth wrong is the Sword. Yes, you know, a guy with a big sword sharp, crer can kill you in a while and make you bloody noodles. Tenth is Tonfun, he has two Tonfy, so his hands are almost invulnerable and you have to look for other vulnerabilities. The eleventh in a row is Blues, which is very fast and its main weapon is very long and fast legs. As I said at the beginning in Yie Ar Kung Fu, your only weapon is your speed and the huge amount of shots and kicks you control. I've finished this game to the end and I recommend it to you too. It's just a great game !!!! Locked - can not add new posts.